This beautifully crafted hand made Brook Lyn guitar is in excellent condition and at a quick glance could be mistaken as being new. Its the popular 12 fret to body model from the very sought after Brook family of instruments. Crafted using traditional guitar building techniques by hand in a rural Devon workshop, this wonderful sounding intuitive Brook Lyn has lots to offer any player. We include a full customs set up and secure courier delivery. A full set of images available on request. This superb condition pre owned Brook Lyn guitar offers players a remarkable and creative intuitive playing experience packed with delightful tonal character. It offers a stylish looking 12 fret to body 45mm nut size model and it comes with Hiscox hard case. This particular Brook Lyn also benefits from some carefully selected European Spruce in its top with an attractive superb sounding all solid Cherry back and sides. Although this is a pre owned model it is in especially nice condition and has been very well looked after by its previous owner. We really enjoy all the full tonal character that the Euro Spruce and Cherry combo has to offer. Its a clear and balanced yet rich Brook style of tone that has just the right amount of wonderful harmonic shimmer around even the lightest of touches. This guitar plays effortlessly with a comfortably low easy action and will delight any experienced demanding acoustic musician. 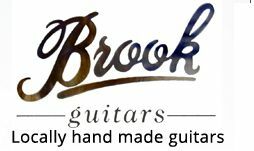 Read on to hear more about this fine hand crafted instrument and to find out more about its creators - Brook Lyn guitar European Spruce with Cherry back and sides with comfortable versatile mid size body design and intuitive 630mm scale. This lovely Brook Lyn is one of only a few select instruments that the sought after Brook workshop will finish each month. We are lucky to be very close to the rural Devon workshop as it is situated just on the outskirts of Dartmoor National Park close to our showroom. Its a fascinating workshop, and the second you step foot through the doorway you can tell immediately that these guys are lovingly and slowly creating by hand the traditional way some of the finest acoustic guitars available today.